Postpartum Hair Loss can be scary! Especially when you’re not expecting it! It’s been about 3 months or so and you’re finally starting to feel better after having your baby. Unfortunately, you start to notice that you are having severe hair loss! It seems like it is falling out in clumps. Normal hair loss is 80 hairs a day. 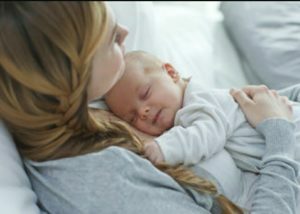 New moms can experience as much as 400 strands of hair loss a day! If you have fine, thin hair it can seem devastating! The good news is that postpartum hair loss is totally normal! Still scary, but normal! Postpartum hair loss usually starts 3 months after you’ve given birth and can last up to the 6th or 9th month. The good news is that it is temporary and your hair should grow back! High levels of the hormone estrogen during pregnancy helps keep your hair strong and healthy. Many women say they stopped shedding hair all together while they were pregnant. After giving birth, the estrogen levels drop dramatically and all of the hair you didn’t loose for 9 months seems to fall out all at once! Nutritional deficiencies can also add to hair loss. Nutritional requirements change dramatically going to pregnancy to postpartum. Your body needs more nutrients especially if you are breast-feeding. It’s important to maintain a healthy diet with lots of protein. It’s important to continue to take your vitamins and to add a vitamin that promotes hair strength and growth. Biotin is the vitamin most helpful for hair health. Keeping your hair trimmed and conditioned will also help the appearance of thinning hair look fuller. It helps to be prepared and take steps with your eating habits and hair health before the hair loss starts. Brooke and Harbor did my and my 4 bridesmaids’ hair on my wedding day, and I couldn’t have been more thrilled with the results! My hair is VERY difficult to work with, doesn’t (usually) hold curls for more than a few hours, but I was determined to wear my hair down and curly. Brooke worked a miracle, and my curls held all day AND night! My bridesmaids’ hair styles were great – a mixture of up-dos and down-dos. Brooke and Harbor are also very sweet, flexible, and easy to work with. Definitely recommend Brooke Rockwell Hair Design!